There are plenty of conversion apps out there, but this one caught our eye for its simplicity. 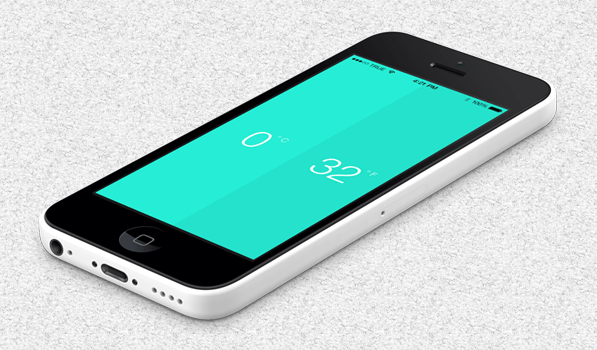 Dgrees is a simple iPhone app that lets you convert between Celsius & Fahrenheit. That’s it. Not buttons, no settings. Just a simple app to help you with your temperature conversions. When you launch Dgrees, you see two columns on the screen. The left one is for Celsius and on the right is Fahrenheit. You can swipe up/down in each column to change the values — there’s no keyboard. As you drag your finger, the value in the other column changes as well. To make things easy, you see a previw of the current column value at the top of the column. This might sound confusing as you read it here, but it’s insanely intuitive. To reset, shake your phone. If you hold your finger closer to the edges, the count increases or decreases continuously. I also love how the background color changes based on the temperature. If you’re near the cold temperature, the background is blue and as you move higher, it changes to bright red. Dgrees is designed to be a super intuitive and is available Free on the App Store.